Just as fashions and trends change in the world of clothes, so can the world of interior and venue design. Ultimately the choice of course comes down to the preferences, choices and themes indicated by the bride and groom, after all it is their big day and they may have had years of dreaming about their perfect décor. But it’s also worth knowing what new and interesting ideas are out there to be explored and incorporated in to your design. 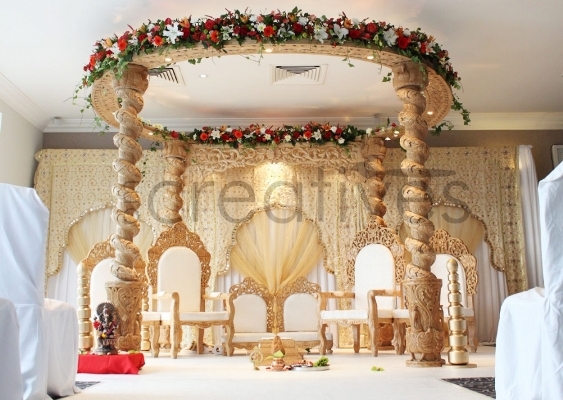 This week we are giving you some of our top picks for great mandap decoration. Floral Mandaps – These mandaps are becoming more and more popular, particularly because of their versatility. With an almost unlimited selection of flowers and floral arrangements to choose from, these can be changed and adapted to suit your style and colour themes. They can also seamlessly match with your table decorations or bridal bouquets. The freshness and elegance of floral mandaps brings a spring-like environment even in the weddings undertaken during the cold winter months. What’s more you can even keep some of the arrangements as wedding mementos! Fabric Mandaps – Although you will have a basic solid, sturdy framework, a great current trend is to use fabric as a mandap embellishment. Not just your standard white plain fabrics, but different fabrics, colours and textures. From rich luxurious velvets to light and feminine net or from sublime silks to delicate lace. Again the flexibility and adaptability of these fabrics means you can create wonderful effects that match your table décor or complement the bridal and groom attire. Statue Mandaps – we’ve been providing Asian wedding decorations for quite some time and can firmly state that these grand and astounding statue mandaps are creating quite a stir. They certainly have the wow factor if you’re looking to take your guests breath away. You can incorporate animal or religious statues in to the framework itself as well as the aisle and the crowning top of the mandap. Also, because most statue mandaps come in buildable pieces you can pick and choose which bits to use together. But whichever mandap styles you choose where as wooden carved mandap, floral mandap, fabric mandap or statue mandap; do ensure you have a knowledgeable and helpful Asian wedding specialist like us to help and support you along the way. With the bride and groom centre stage on the wedding day and all gazes firmly on them, the wedding stage is an absolutely crucial feature of the wedding venue that needs care and attention in preparing. Like any interior design project a venue design requires planning and thought, so we – as specialists in mandap decorations – have provided some helpful tips on how to get the most out of your wedding stage for your big day. One of the best pieces of advice we can give the bride and bridegroom or the wedding planner is to really get to know the space that you have in the venue. Understand the opportunities and the limitations that the space affords. This way you’ll have the size of the spaces at hand and can make better decisions as to what kind of stage you can accommodate without it being lost in the rest of the decor or without it being overpowering and obstructive. You may have an idea or theme in mind for your wedding stage, but it’s worth taking the time to look at as many ideas and variations of your theme as possible. Sometimes your original plans won’t or can’t work for practical reasons so it’s definitely beneficial to come armed with more than one idea. Specialists in Indian wedding stages like us, have lots of ideas and suggestions and can offer good insight in to what is logistically possible and what can be achieved with the space you have. Your wedding day is meant to have impact and the ‘wow’ factor, so don’t be frightened to inject colour and texture in to the mix. Using fabrics and lighting is an ideal way of doing this and can really bring out the ethnic flavor to the decorative set up of the stage. But like anything there is a danger of getting carried away so use colour charts and colour wheels to see what colours work well together or ask experts like us for additional advice. Indian wedding decorations are known for their exquisite lavishness and strikingly beautiful impact. But with so many types of embellishments to choose from it’s easy to over-decorate. You need to bear in mind that the bride and groom are the focal points for the guests and the stage setting should complement their look not detract attention away from it. Lastly, decorating the wedding stage a project in its own right but should be taken in to consideration with the whole. When thinking about the decoration of the stage, it’s worth thinking about the day as a whole. Where is everyone going to be situated at different parts of the day, is there space for the photographers, how easily can key active members of the wedding party gain access to the stage? These are all important questions that you need to ask when designing your stage set up. But we’re always on hand to give our advice and expertise so that your wedding stage meets your every need. Your wedding is the one of the – if not the- biggest celebratory occasion of your life and takes much time, energy and money in preparing for it. So it stands to reason that you want a visual feast for the eyes of your guests and yourselves when you enter your wedding venue. Even if the venue itself is a fabulous location, it’s important for you as a couple to personalise it with your own ideas and personality to make it the perfect setting for your wedding. That’s where a specialist in wedding mandap decorations, like us, can really benefit you. We have been providing Asian wedding stages UK wide for many years. So with this level of knowledge and expertise we can transform any simple or complex venue in to a complete magical environment in which to sanctify and ratify your marriage. From classical to modern, religious symbolism to simplistic features – whatever the theme or scheme this can be incorporated in to the venue with ease. Our reputation has grown and thrived over the years as specialist who are able to accommodate ideas and themes – however seemingly difficult – and bring them to life spectacularly. As a provider of Asian wedding decorations services, we are well versed in how Asian weddings (whatever the cultural background) function, so come armed with knowledge and advice on how best to make use of the available space to account for various rites, customs and rituals that you may need to perform on the day. Whether you need a mandap ceremony set up or a nikaah area prepared, we can make the most of the space available and produce beautifully crafted set-ups and stages that ensure the bride and groom take centre stage with optimum view for all of the guests and maximum impact for photography and practicalities. Our advice is to think about shape and space, sound and light as well as the events of the day. Don’t be afraid to ask questions and take advice where offered – as this will all amount to creating the right atmosphere for the day. We use a fantastic selections of materials, embellishments and statuettes as well our expertise in choreographed lighting and effective use of colour all combine to ensure that the bride and groom have the venue of their dreams on the most important day of their lives together.